LA JOLLA—In the bustling setting of the cell, proteins encounter each other by the thousands. Despite the hubbub, each one manages to selectively interact with just the right partners, thanks to specific contact regions on its surface that are still far more mysterious than might be expected, given decades of research into protein structure and function. Now, Salk Institute scientists have developed a new method to discover which surface contacts on proteins are critical for these cellular interactions. The novel approach shows that essential new functions can be uncovered even for well-studied proteins, and has significant implications for therapeutic drug development, which depends heavily on how drugs physically interact with their cellular targets. The paper appeared in the early online version of Genetics in late November, and is slated for publication in the January print edition of the journal. Amino acids are the building blocks of proteins. Their specific linear arrangement determines the identity of a protein, and clusters of them on the protein’s surface serve as contacts, regulating how that protein interacts with other proteins and molecules. Lundblad and her colleagues suspected that, despite decades of work deciphering the mysteries of proteins, the extent of this regulatory landscape on the surface of proteins had remained mostly unexplored. Long ago, her group unexpectedly discovered one such regulatory amino acid cluster, while searching one-by-one through 300,000 mutant yeast cells. Although that work opened up a new area of research in the field of telomere biology, Lundblad was determined to figure out a more robust methodology that could rapidly uncover many more of these unexplored protein surfaces. Enter John Lubin, now a PhD student in Lundblad’s lab, who began working with her as an undergraduate. “My task was to figure out how to search through 30 mutant yeast cells, instead of 300,000, to discover new activities for a protein,” says Lubin, the paper’s co–first author. Timothy Tucey, the other co–first author, was a postdoctoral researcher in Lundblad’s group and is now at Monash University. Together they turned to a protein called Est1, which Lundblad had discovered in yeast as a postdoctoral researcher in 1989. Est1 is a subunit of a protein (an enzyme) called telomerase, which keeps the protective caps at the ends of chromosomes (known as telomeres) from getting too short. As the first subunit of telomerase to be discovered, Est1 has been subjected to intensive study by many research groups. 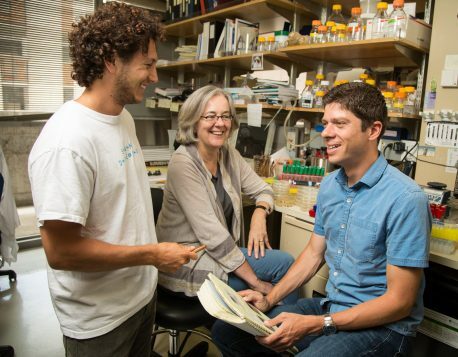 The Salk team’s approach involved introducing a small, but customized, set of mutations into yeast cells that would selectively disrupt surface contacts on the cells’ Est1 protein. The team then analyzed the cells to see what effect, if any, the various mutations had. Abnormalities resulting from a specific mutation would suggest what the role of the unmutated version was. To do so, they used a genetic trick, by flooding the cells with each mutant protein, and looking for the rare mutant protein that could interfere with cell function, as their previous work had shown that this would preferentially target the protein surface. Lundblad’s team discovered four functions for Est1 through this approach. Impairment of any of these four functions by mutations to Est1’s surface amino acids, the scientists found, resulted in cells that had critically short telomeres, indicating specific roles for the Est1 contacts in the telomerase complex. Using this approach, her team has already uncovered new functions for a set of proteins that regulate the stability of the genome, and has also applied for grants that fund research into drug targets. The work was funded by the National Institutes of Health, the National Science Foundation, the Rose Hills Foundation and the Glenn Center for Aging Research.